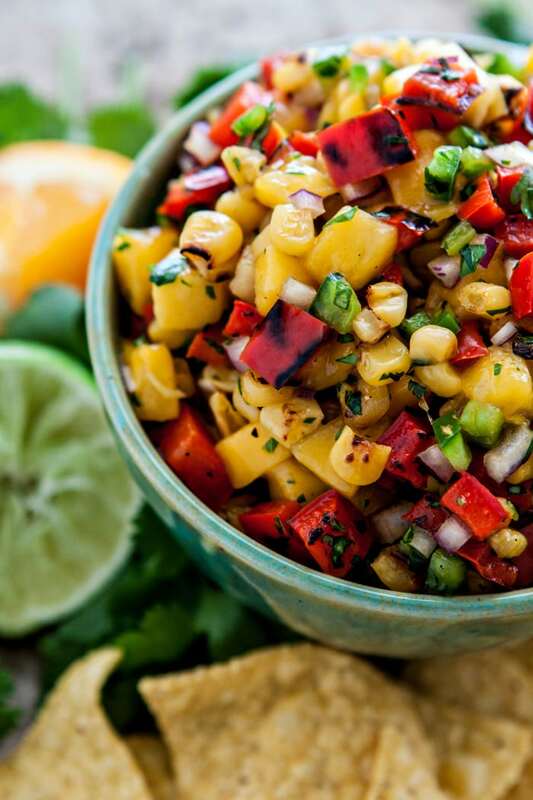 In this recipe for Mango Salsa with Grilled Corn and Blistered Red Peppers, juicy mango pairs well with grilled corn and blistered red bell peppers for a sweet and savory summertime salsa. I love making different, unique homemade salsas. I don’t think salsa just has to be the traditional tomatoes, onion, jalapeño, cilantro, and lime that you might think of when chips and salsa come to mind. Sweet corn is in abundance this time of year, as are mango and red bell pepper. 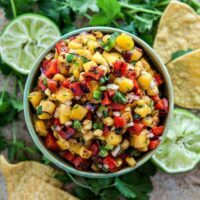 So, this Mango Salsa with Grilled Corn and Blistered Red Peppers is a great recipe to make when you start seeing these prices super low at the grocery store. Especially if you’re in the mood to change up your salsa for something more unique (or Up Your Taco Tuesday Game). You can use canned corn if fresh corn isn’t in season or if it is what you have on hand. I’ve included instructions for both in the recipe below. As for mango, you can easily get away with frozen Mango if you don’t have fresh on hand. I find it easiest to cut the frozen mango into slightly smaller pieces while it is still frozen, and then let it thaw. That way the mango chunks are similar in side to the rest of the ingredients rather than being large chunks. We actually had corn last night with dinner, and then it reminded me that I had made and photographed this recipe and still needed to get it published. I don’t really have an interesting story about this one, or anything funny or cute that the kids said. I think that’s ok that sometimes there is just a recipe that I’m saying we made and is good. I love salsa for a lot of different uses, not just for snacks. Below you’ll find some of my favorite uses. 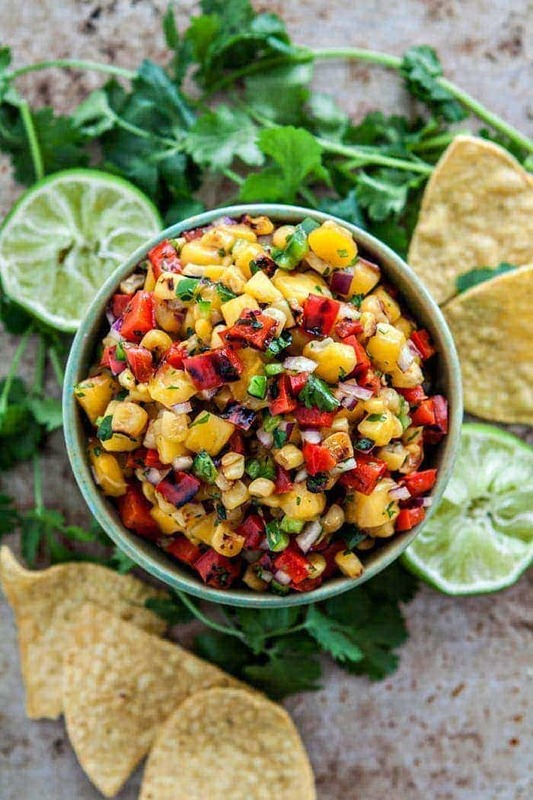 This Mango Salsa with Grilled Corn and Blistered Red Peppers is the perfect summery, creative salsa to add lots of color and flavor in a variety of uses. 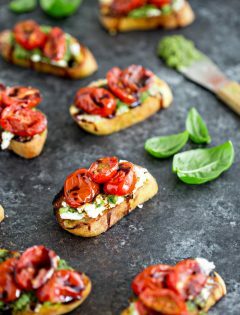 Hello one of my absolute favorite healthy snack ideas! Second or third only to Easy Kale Chips or 5 Minute Guacamole. Salsas with tortilla chips make a great snack when you need to satisfy a salty, crunchy craving. Especially when you make fresh homemade salsas using a variety of produce. I’m sure I’m not the only one who has practically filled up on chips and salsa at a restaurant before the dinner has arrived! Marinade some skirt or flank steak (I love this flank steak fajita marinade recipe), slice it against the grain, and spoon salsa over top. For chicken, I like to make this Cilantro Lime Marinade recipe for a Mexican inspired grilled chicken. 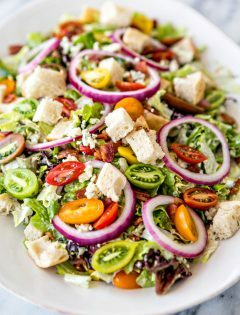 Just add greens and now you have a super interesting salad with lots of fresh flavor. Add one of the grilled meat ideas from above, pepitas (green pumpkin seeds) and crunchy tortilla strips for a delicious entrée salad. Make your favorite tacos and use this salsa in place of jarred grocery store salsa. If you’re craving something lighter, substitute lettuce leaves (butter lettuce or iceberg work best) for the tortillas to create a Mexican lettuce wrap like I did in these Lettuce Wrap Carnitas. Stir a generous amount of salsa into steamed white rice to create a colorful, easy side dish. 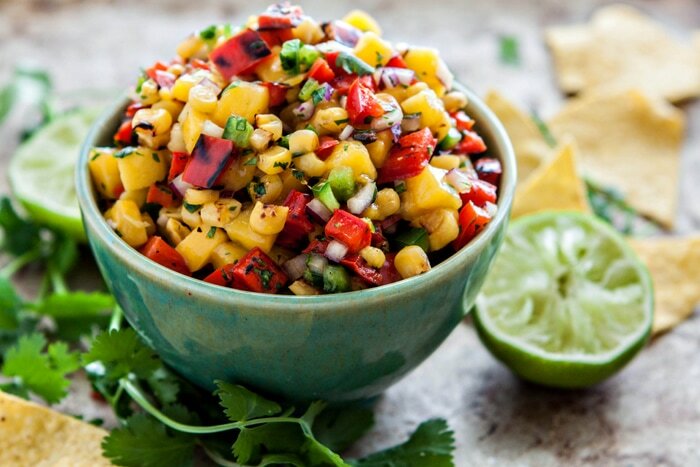 For a different variation of a Mango Salsa, try this Strawberry Mango Salsa recipe. 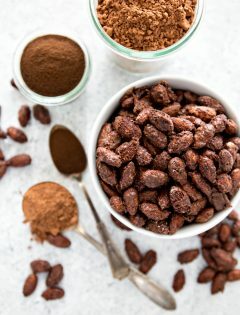 Serve it with cinnamon chips! For a classic chips and salsa snack, try this Easy Restaurant Style Salsa; it is super quick to prepare. This Easy Roasted Salsa Verde is a mix of roasted tomatillos, roasted poblano pepper, roasted jalapeño pepper, fresh garlic, cilantro, and shallot. Bonus: It add it to the slow cooker with chicken breasts for an easy chicken recipe OR use it as a green enchilada sauce. Creamy Cucumber Salsa is great when you’re craving something light, creamy and cool. I need to remember to make this Fresh Zucchini Corn Salsa this summer when zucchini and corn are abundant and inexpensive. Pomegranate Salsa is a delicious, fresh and fruity salsa recipe to keep in mind this winter (it seems far away, but it will be here before we know it…unfortunately! ); it will add a bit of brightness during those darker, cold days. Roasted Cranberry Salsa combines roasted fresh cranberries pair perfectly with the traditional elements of salsa – jalapeño, cilantro, onion, and lime for a spicy, fruity salsa. This is another perfect salsa to bookmark for fall and winter. What is your favorite recipe for salsa? After the red pepper and corn mixture has finished roasting, add that to the mango mixture and stir to combine. Season, to taste, with salt and pepper (if desired). For canned corn: Drain, rinse and pat dry before proceeding with the recipe. For fresh corn: Boil until cooked, cool, then cut off the cob and pat dry before proceeding with the recipe.